Gift Vouchers/Gift Certificates are now available in denominations of £20, which can be used towards Flutes at the Barns deposits or balance payments. If you are looking for a present for an enthusiastic flute player in your life look no further! 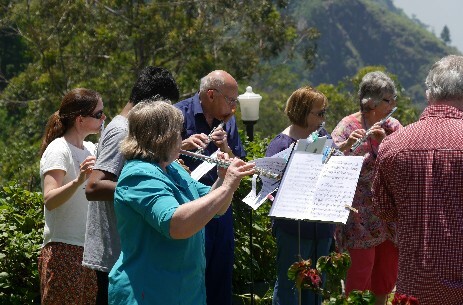 If you are the flute player, why not drop a few hints next time your birthday, Christmas or an anniversary comes around? FATB Gift Certificates are attractively printed on top quality card, and come neatly presented in a fitted, white envelope. Zocopoco Limited Gift Certificates may be used against deposit/balance payments for Flutes at the Barns courses. Gift Certificates may not be exchanged for payments already made, other goods or cash, and are not transferable for value. Bookings are subject to availability. Gift Certificates must be valid when presented as payment (there is an expiry date of two years from the time of purchase). If the value of Gift Certificates exchanged by you exceeds the payment, change will be given as Gift Certificates, unless the amount of such excess is less than £5, when it will be given to you in cash. If a payment is more than the value of the Gift Certificates exchanged, you will be required to pay the balance. Flutes at the Barns is a division of Zocopoco Limited, registered in England and Wales no. 7287733. Registered office: 30 Whitecroft, St Albans, Hertfordshire AL1 1UU.